PAN card is an important document that is needed for each financial transaction more than Rs.50, 000 (Fifty Thousand). It is significant to know your PAN Jurisdiction as sometimes you have to convene your jurisdictional assessing officer that directly connects with your PAN card number. Every PAN card number has its own specific jurisdiction that allows holders to take tax verdicts as well as to make decisions about it. What is PAN Card Jurisdiction? A person who has a jurisdiction is known as Accessing Officer (AO). He has all the power to take decisions for the tax under the act. Based on the volume of income of Indian citizens, the Central Board of Direct Taxes owed diverse categories of officers such as assistant commissioner, deputy commissioner, joint commissioner, etc. You cannot find your jurisdiction PAN code in your permanent account card numbers as Accessing Officers may alter as per their pay scales. In that case, we have to know our jurisdiction accessing officer’s information in the database that is stored in the database of Income tax department. 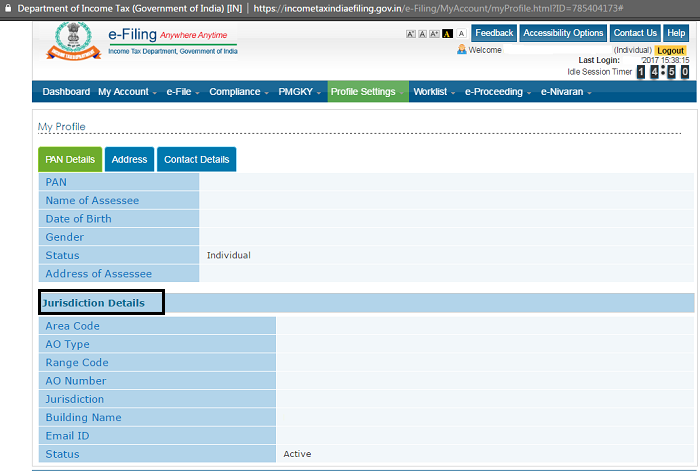 First Visit to e-Filing Home Page at www.incometaxindiaefiling.gov.in, here you will “Services” Section on left side of page, Under which there are several option available to Income Tax. 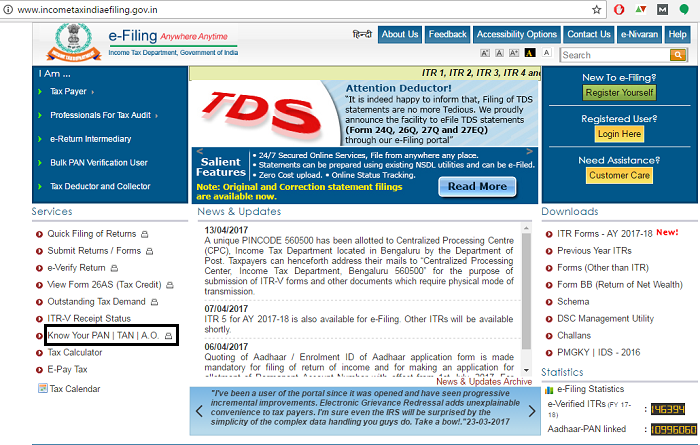 Then you have to first registered with Income e-Filing Official site to Know Your Jurisdictional A.O. Online. 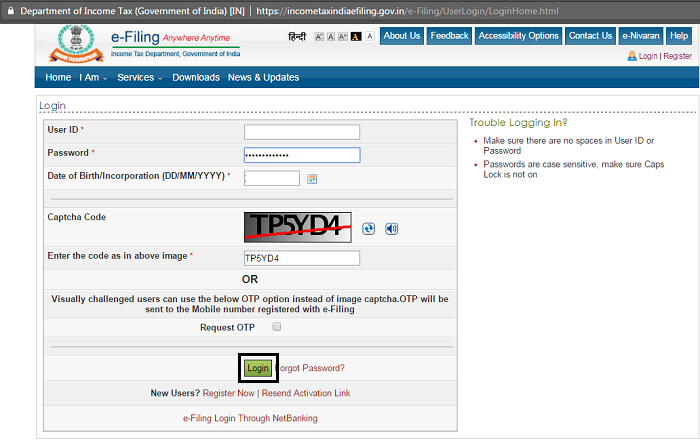 Now Lets Start with Login, Enter Login Details as User ID (its PAN Number), Password, Date of Birth and Enter the Code as shown in Image or you can use “Request OTP” Method instead of writing Captcha Code, Now Click on “Login” button. Get complete details as soon as feasible because after fifteen minutes session will end involuntarily. In that case, you have to load the page again and start with a new session. Finally you have Known Your Jurisdictional Accessing Officer(A.O.) Income Tax. PAN Card holders can also know their TAN Jurisdiction as all the importations related to PAN card is simply present on the website of Indian Government. It is very simple to alter or change your jurisdiction details. By following below given steps you can alter your jurisdiction. 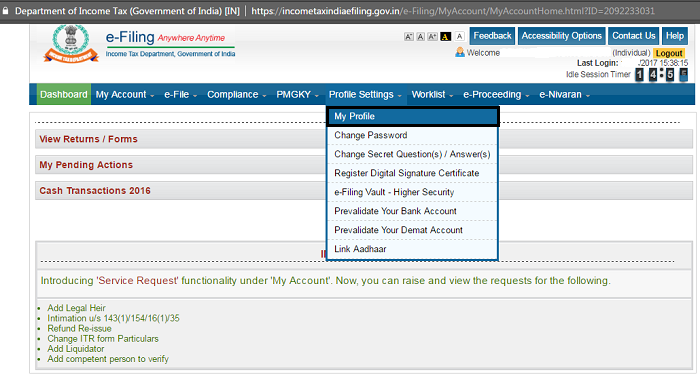 First, fill up six copies of application form and send it to Accessing Officer and CIT as per rules of Income Tax Department Act that was established in 1961. After getting your file, the tax department will assign new AO officer. But, the repayment process is done through Central Processing Centre or CPC.